So, when you argue do not let your hearts get distant, do not say words that distance each other more, else there will come a day when the distance is so great that you will not find the path to return. Radhanath Swami says that anger is a very dangerous thing. It can deviate even the intelligent to be degraded. A very good person can live the rest of his life in a prison due to his one mistake he made when he lost his temper. Very informative article! So true that when people are angry, they tend to shout at each other. Very wonderful explanation is given that people shout because their hearts are distanced. Thank you for sharing. Amazing explanation of the distance of hearts when people are angry at each other. Its a very informative & useful lesson on Anger Management by Radhanath Swami. “When two people are angry at each other… their hearts are distant” – how beautifully anger has been explained. The sentence has caught the gist of anger. This also means that if you continue to love everyone, you won’t get angry. Good advice. I also fell pray to this whenever I was angry and later in almost all the cases , I repented. The article is so beautifully written. The thoughts about distance between hearts is so true. Radhanath Maharaj uses such simple ways to explain the concepts that are relevant to every person. The last line of the article is very true. I know that there are many people in prison who just did one wrong thing in their lives, in a fit of anger.. and now they have to suffer for the rest of their lives. One can use the suggestions given in this article, in our real lives. If your relationship is important, “dont’ say words that distance each other more”. I think that’s the golden rule to take away from this article. an instructive article on “anger”. The explanation of how when the distance increases between two people, the sound increases was the highlight of the article. As HH Radhanath Swami says, one small mistake made in anger may lead us to eternal difficulties. How oftne this happens in many examples we see in the lives of others. Hope I deeply contemplate on this warning of HH Radhanath Swami and try to implement. Anger is such an amazing and powerful thing. 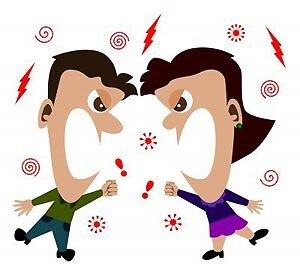 In the absence of proper guidance and training, a moment’ anger has the power to overcome even a lifetime’ effort spent in training one to lead a life of self-regulation. A very important piece of information for all especially married couples..
Its very true, and i got so inspired that i shared this article with all of my colleague in office. Thanks you Maharaja for this nice article. Thank you very much Radhanath swami for this wonderful article on the consequences of anger. Thank you for this amazing story! Anger is indeed so detrimental to our life! When we add one alphabet D to Anger, it turns to Danger. Very nice explanation given by H.H.Radhanath Swami Maharaj. Many thanks to Radhanath swami for pointing out the ill-effects of anger.